While still in school learning to become a winemaker, I had my first contact with composting. I noticed that this was definitely a “hot” topic, but could not imagine, that it would later be my passion! A few years after finishing school, I was thinking about a technology to use the excessive heat, which is produced during the thermophilic composting process (also called hot-rotting). complete solution modeled by nature. During my investigations in the, at this time, new Internet, I stumbled for the first time on the topic of vermicomposting. It was like rediscovering something forgotten: A system, that was perfect for millions of years, it was strange that we did not use it any longer in agriculture! At this time, vermicomposting was, on a large scale, only done in the USA, and even there, the production of worms as a bait was the main business, not the production of BIOHUMUS. I travelled to California, talked to practitioners and scientists, even at the University of Berkeley. There they affirmed my ideas and we talked about the potential of reducing food waste at the landfills and at the same time producing high quality fertilizer. It was quite a strange situation: Vermicomposting was nearly unknown outside of the USA, but did not develop inside the USA, because of a lack of environmental awareness. Even if there was some recognition by the slowly growing organic community and the Lower Austrian initiative “Natur im Garten”, there was nearly no market for my BIOHUMUS. The first one, who was open to my work was the member of the Lower Austrian government, responsible for environment, Mag. Wolfgang Sobotka. He initiated the “Lower Austrian Worm Composting System for Schools and Kindergarten”, my first larger order. This project even brought us an award from UNESCO. In 2009, I talked to Leopold Fischer, my future business partner. He is a consultant for business development and together we worked on a business plan to find out, if this project could be a sustainable business, too. 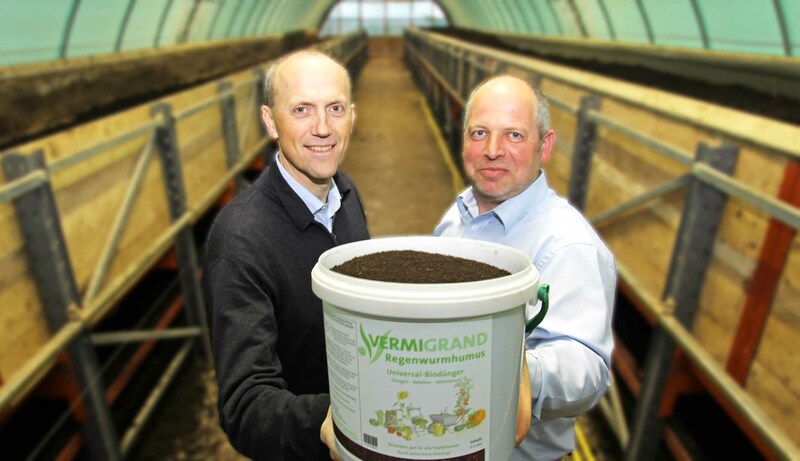 After one year of cooperation, we decided to found the VERMIGRAND Naturprodukte GmbH together and so, to my knowhow in production, development and research was another valuable knowhow added – business, economics, administration and management. As you can see from our history down below, together we work hard on developing our company. We would be glad, if you join the “growing” community of satisfied customers in the future!